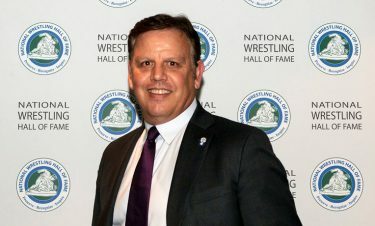 Michael Child of Houston, Texas, began serving as a member of the Board of Governors of the National Wrestling Hall of Fame in 2015. He was a member of the state champion wrestling team at Midwest City High School in Midwest City, Oklahoma, and lettered in football and wrestling at Colorado State University, where he was a two-time Academic All-American. He competed in freestyle wrestling after college, including the 1992 Olympic Trails. Mike’s competitive wrestling career ended in 1993 when he donated a kidney to his younger brother, Mark. Mike was an assistant wrestling coach at Midwest City High School for almost 10 years. He has worked in the automotive retail industry for more than 20 years, beginning Oklahoma with the Hudiburg Auto Group and continuing for the last 15 years as a general manager with AutoNation, which is America’s largest automotive retailer with over 200 sales and service locations in 17 states. Mike, who has won AutoNation’s coveted President’s Award a record nine times, lives in Houston, Texas, with his wife, Maria; daughter, Francesca; and son, Michael, Jr.
Why is it important to be involved with the National Wrestling Hall of Fame? The National Wrestling Hall of Fame promotes our heritage and keeps our sport strong. Wrestling is the most competitive and character-building sport there is, and the Hall of Fame helps ensure that those individuals excelling in the sport and those who are helping to grow and move it forward are recognized. How did you find the sport of wrestling? Wrestling actually found me in my hometown of Midwest City, Oklahoma. I had a brother that wrestled and in the third grade I wanted to go wherever he went. The wrestling room was very competitive. We had three or four people in my grade school who ended up being national champions in Division II or All-Americans in Division I. It was one of those things where you aspire to be like your older brother. There were a lot of good kids in our area. It was a great system to grow up in. How does your wrestling background benefit you in your current position with AutoNation? Wrestling influences my work every way possible. From self-discipline to competitiveness to tenacity – I attribute it all to wrestling. I do what our competitors aren’t willing to do. I’ll watch the Dan Gable DVD “Competitor Supreme” when I need to do a little more and I need to do a little bit better or when things aren’t going my way. I pass that out to a lot of my managers. That’s the way you beat people. My industry is very competitive. You can be smarter but you still have to outwork your opponents. Not many people are willing to do that. When you think you’ve done enough then you think about what the champions would do. What would Gable do? He probably would go back and work some more. It’s very inspiring. Some might think I’m a little bit of a lunatic — and I might be. Psychologically, my competitors are beat because they just aren’t willing to outwork me. Wrestling is my life. Every good thing I have in my life I can take back to a coach or a wrestling philosophy. I like to work and I can attribute that to wrestling. What should people know about the automobile industry that they might not know already? Because of competition, capitalism and free enterprise, the automobile industry is not as criminal as people might believe. People have a tendency to place labels on the car industry, which might have been deserved in the past but which aren’t well deserved now. I would not be in this business if I could not do it ethically and morally w people like I would treat my best friends or my family. It wouldn’t be worth it if I had to sacrifice any of that. It’s so competitive right now with Google Reviews, Facebook and social media that you don’t dare make a mistake. People are going to form an opinion even if you don’t make a mistake and you do everything perfect. I love capitalism because I think bad businesses will fail on their own because of their habits. Eventually it’s going to catch up to them. Good businesses are going to succeed every time. The only way I can outperform someone is through customer service, doing more and doing extra for the customer that no one else is willing to do. Texas is known for football. How do Texans view wrestling? They’re getting into it. It’s interesting that every wrestling program in Texas has a girls wrestling team and a guys wrestling team — and they’re very competitive on both sides. In Oklahoma you grew up with wrestling and in Texas you have so many other alternatives. Texas is so far south that you can compete in spring sports year-round. People in Texas pick up on wrestling when it’s involved in Mixed Martial Arts. The bigger UFC gets the more you’re going to see wrestling in Texas.